Looking at Omar Lizardo’s website, I found links to the reading lists for the courses he is teaching. I’d really like to work through these in future, particularly the one of Cognitive Sociology. I’m not sure what happened this week. 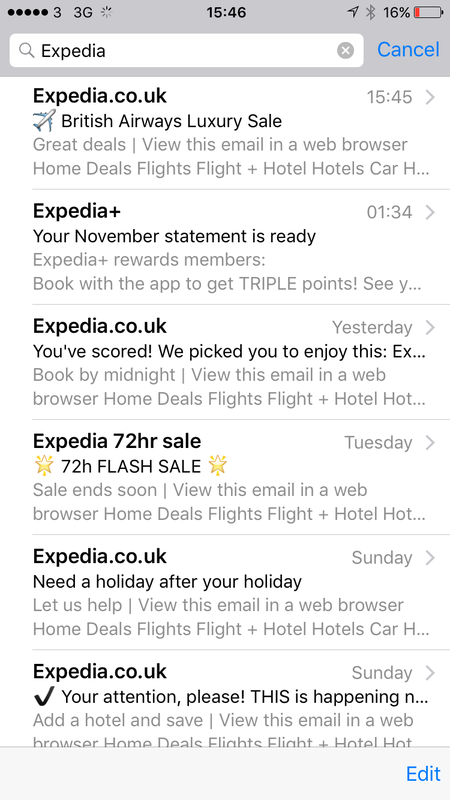 Does Expedia have a new marketing strategy? Have I been algorithmically marked as a customer they’re at risk of losing? I suspect the latter, as I booked 4 trips to Europe in the space of two weeks last month and haven’t booked anything since. Such examples are individually trivial. But I argue in my new book that escalation dynamics lead to a competitive spiral, comprising copying and innovation, characterising attempts to capture the attention of increasingly distracted people. The cumulative impact of this tendency is to an increase in the background noise of social life, an outcome of much sociological significance which sociology is currently ill equipped to grasp due to the lack of a meaningful sociology of thinking. There is an undergraduate module on the Sociology of Thinking! Fascinating to discover the existence of this at Rutgers – course outline here! Welcome to our class on the Sociology of Thinking! This semester we’ll explore sociology’s contributions to our understanding of the way we think. By focusing on families, organizations, professions, ethnic groups, religious groups, and other “thought communities” rather than on individuals, this course sheds light on the impersonal, conventional, and normative aspects of the way we perceive, remember, reckon time, make distinctions, notice and ignore things, assign meaning, as well as construct our identity. Why are some interactions energising while others are not? This is not to say that the individual does not exist. But an individual is not simply a body, even though a body is an ingredient that individuals get constructed out of. My analytical strategy (and that of the founder of interaction ritual analysis, Erving Goffman), is to start with the dynamics of situations; from this we can derive almost everything that we want to know about individuals, as a moving precipitate across situations. Here we might pause for a counterargument. Do we not know that the individual is unique, precisely because we can follow him or her across situations, and precisely because he or she acts in a familiar, distinctively recognizable pattern even as circumstances change? Let us disentangle what is valid from what is misleading in this statement. The argument assumes a hypothetical fact, that individuals are constant even as situations change; to what extent this is true remains to be shown. We are prone to accept it, without further examination, as “something everybody knows,” because it is drummed into us as a moral principle: everyone is unique, be yourself, don’t give in to social pressure, to your own self be true–these are slogans trumpeted by every mouthpiece from preachers’ homilies to advertising campaigns, echoing everywhere from popular culture to the avant-garde marching-orders of modernist and hypermodernist artists and intellectuals. As sociologists, our task is not to go with the flow of taken-for-granted belief–(although doing just this is what makes a successful popular writer)–but to view it in a sociological light, to see what social circumstances created this moral belief and this hegemony of social categories at this particular historical juncture. The problem, in Goffman’s terms, is to discover the social sources of the cult of the individual. It’s strange to only really discover Collins after I’ve finished my PhD. In a very real way, his project is the mirror image of my own: to develop situational micro-foundations for macro-sociology i.e. how can the analysis of everyday life be made most amenable to drawing out the connections between micro and macro? However Collins argues that the situation rather than the individual should be the starting point while I argue that we should understand situations as composed emergently of individuals in movement – the crucial factor conditioning a situation, as well as the situated and structured milieu* in which it unfolds, being what the individuals bring to that situation – the propensities and liabilities, the expectations and concerns, originating through the personal changes they have undergone as a consequence of past situations and analytically distinct from the present situation. While Collins says that “A situation is not merely the result of the individual who comes into it, nor even of a combination of individuals” because “Situations have laws or processes of their own” I’d agree but I see the causality differently: I see any number of people P(n) with distinct characteristics at a ‘moment of entry’ to a situated milieu with distinct characteristics M – one of the characteristics of P(n) are the existing relations obtaining between them R(n). So we have (Pn) + R(n) entering M. The situation S unfolds because of how P(n) interact with each other, conditioned by the characteristics of R(n) and M(n), while they contribute to the reproduction or transformation of P(n), R(n) and M as a result of their situated interaction – everything (potentially) changes in the interaction situation, include those party to it. There are a finite number of true statements that can be made about P(n) at the start of any interaction situation and the truth of those statements can be analysed in terms of the consequences of past interaction situations. It’s only through analytically distinguishing between these changes that we can gain traction on the links between situations i.e. how what P(n) bring to future situations was shaped by their experience of past situations. Am I proclaiming, on the micro-level, the primacy of structure over agency? Is the structure of the interaction all-determining, bringing to naught the possibility of active agency? Not at all. The agency / structure rhetoric is a conceptual morass, entangling several distinctions and modes of rhetorical force. Agency / structure confuses the distinction of micro / macro, which is the local here-and-now vis-à-vis the interconnections among local situations into a larger swath of time and space, with the distinction between what is active and what is not. The latter distinction leads us to questions about energy and action; but energy and action are always local, always processes of real human beings doing something in a situation. It is also true that the action of one locality can spill over into another, that one situation can be carried over into other situations elsewhere. The extent of that spillover is part of what we mean by macro-patterns. It is acceptable, as a way of speaking, to refer to the action of a mass of investors in creating a run on the stock market, or of the breakdown of an army’s logistics in setting off a revolutionary crisis, but this is a shorthand for the observable realities (i.e., what would be witnessed by a micro-sociologist on the spot). This way of speaking makes it seem as if there is agency on the macro-level, but that is inaccurate, because we are taken in by a figure of speech. Agency, if we are going to use that term, is always micro; structure concatenates it into macro. Perhaps the best we might say is that the local structure of interaction is what generates and shapes the energy of the situation. That energy can leave traces, carrying over to further situations because individuals bodily resonate with emotions, which trail off in time but may linger long enough to charge up a subsequent encounter, bringing yet further chains of consequences. Another drawback of the term “agency” is that it carries the rhetorical burden of connoting moral responsibility; it brings us back to the glorification (and condemnation) of the individual, just the moralizing gestalt that we need to break out from if we are to advance an explanatory microsociology. We need to see this from a different angle. Instead of agency, I will devote theoretical attention to emotions and emotional energy, as changing intensities heated up or cooled down by the pressure-cooker of interaction rituals. The central mechanism of interaction ritual theory is that occasions that combine a high degree of mutual focus of attention, that is, a high degree of intersubjectivity, together with a high degree of emotional entrainment–through bodily synchronization, mutual stimulation / arousal of participants’ nervous systems–result in feelings of membership that are attached to cognitive symbols; and result also in the emotional energy of individual participants, giving them feelings of confidence, enthusiasm, and desire for action in what they consider a morally proper path. These moments of high degree of ritual intensity are high points of experience. They are high points of collective experience, the key moments of history, the times when significant things happen. These are moments that tear up old social structures or leave them behind, and shape new social structures. As Durkheim notes, these are moments like the French Revolution in the summer of 1789. We could add, they are moments like the key events of the Civil Rights movement in the 1960s; like the collapse of communist regimes in 1989 and 1991; and to a degree of significance that can be ascertained only in the future, as in the national mobilization in the United States following September 11, 2001. These examples are drawn from large-scale ritual mobilizations, and examples of a smaller scale could be drawn as we narrow our attention to smaller arenas of social action. IR theory provides a theoryof individual motivation from one situation to the next. Emotional energy is what individuals seek; situations are attractive or unattractive to them to the extent that the interaction ritual is successful in providing emotional energy. This gives us a dynamic microsociology, in which we trace situations and their pull or push for individuals who come into them. Note the emphasis: the analytical starting point is the situation, and how it shapes individuals; situations generate and regenerate the emotions and the symbolism that charge up individuals and send them from one situation to another. *Because there is structural conditioning that transcends the situation even if this, in turn, can be understood in micro-sociological terms. For instance when students interact in a Student Union bar, the accumulated consequences of a panoply of past situations operate causally in relation to the character of the SU bar, the roles they play within it and the consequent expectations they bring to bear upon the interaction. All these factors have their own history of emergence which can be analysed micro-sociologically but they operate concurrently i.e. statements about their situational origins are ontologically past tense rather than present tense. I use the phrase ‘internal conversation’ because I think Boyd is doing something more here than simply describing the contents of Bond’s mind. These ‘contents’ enter into the narrative because they represent the basis for action rather than solely being a subjective response to the protagonist’s circumstances. “Scarcity captures the mind,” explain Mullainathan and Shafir. It promotes tunnel vision, helping us focus on the crisis at hand but making us “less insightful, less forward-thinking, less controlled”. Wise long-term decisions and willpower require cognitive resources. Poverty leaves far less of those resources at our disposal. Their most arresting claim is that the same effects kick in – albeit not always with such grave implications – in any conditions of scarcity, not just lack of money. Chronically busy people, suffering from a scarcity of time, also demonstrate impaired abilities and make self-defeating choices, such as unproductive multi-tasking or neglecting family for work. Lonely people, suffering from a scarcity of social contact, become hyper-focused on their loneliness, prompting behaviours that render it worse. In one sense, Mullainathan and Shafir concede, scarcity is so ubiquitous as to be almost meaningless. But the feeling of scarcity – of not having as much of something as you believe you need – is something more specific and agonising. To use the authors’ favourite metaphor, life under such conditions is like packing a tiny suitcase for a trip. It entails a ceaseless focus on difficult trade-offs: the umbrella or the extra sweater? The greatest freedom that money can buy is the freedom from thinking about money – or, to quote Henry David Thoreau, “a man is rich in proportion to the number of things he can afford to let alone”. I’ll have to read Eldar Shafir’s work before I can assess whether he is postulating a mechanism in the sense in which I mean the term. However hearing this podcast about economic decision making left me with a greater degree of clarity about the approach I want to take to the sociology of thinking: using the psychological literature to elucidate the cognitive mechanisms underlying personal and social reflexivity, using the former to revise the latter where the account of reflexivity I’m working with is inconsistent with well-established empirical findings about human cognition. However I think I also have a strong position from which to read the psychological literature critically because approaching it from the perspective of the sociology of thinking allows me to open up a space of questions about how social and cultural context condition cognitive processes. Do we not have agency? it is a matter of analytical perspective. Agency is in part a term for designating the primitives of sociological explanation, in part a code word for free will. Do not human beings make efforts, strain every nerve or let themselves go lax, make decisions or evade them? Such experiences clearly exist; they are part of micro-situational reality, the flow of human life. I deny only that analysis should stop here. One has the experience of will power; it varies, it comes and goes. Where does it come from? How do you will to will? That chain of regress comes to an end in a very few links. The same can be said about thinking. Are not one’s thoughts one’s own? Of course they are; yet why do they come into one’s head at a certain moment, or flow out upon one’s lips or beneath one’s fingers in a certain sequence of spoken or written words? These are not unanswerable questions if one has a micro-sociological theory of thinking. To explain thinking is not to deny that thinking exists, any more than to explain culture is to deny that culture exists. Culture, on a micro-level, is the medium in which we move, just as thought and feeling are the medium of micro-local experience in our own conscious bodies. Neither of these is an end point, cut off by a barrier to further analysis. It seems clear that human beings bring specific frameworks of thought, ideas, emotions, and valuations to their social lives, and these frameworks affect both how they interpret the social realities they confront and the ways that they respond to what they experience. Human beings have “frames” of cognition and valuation that guide their experiences and actions. The idea of a practical-mental frame is therefore a compelling one, and it should be a possible subject for empirical sociological investigation. The term “cultural sociology” is sometimes used to try to capture those research efforts that try to probe the meanings and mental frameworks that people bring to their social interactions. We can postulate that human beings are processors of meanings and interpretations, and that their frameworks take shape as a result of the range of experiences and interactions they have had to date. This means that their frameworks are deeply social, created and constructed by the social settings and experiences the individuals have had. And we can further postulate that social action is deeply inflected by the specifics of the mental and emotional frameworks through which actors structure and interpret the worlds they confront. I think these internal constraints and enablements are underemphasised in Archer’s work on reflexivity. They are integral to her account of meta-reflexivity, in the sense that such individuals come to orientate themselves to a cause they have encountered or jury-rigged together from elements in their environment, but she lacks a comprehensive theory of what these resources are. The elements necessary for such a theory, an extremely sophisticated one in fact, can be found in her wider body of work – the distinction between the cultural system and socio-cultural relations, as well as the various situational logics that obtain at this interface, simply needs an account of how cultural relations are mediated at the level of everyday life to flesh out this aspect of human experience. I’ve conceptualised this in terms of recurrent relations between ‘me’ and ‘I’ – at any given moment, my repertoire of routine responses is conditioned by the cultural elements I reflexively orientated myself to at a previous moment in time, in turn shaping how I respond to present cultural variety and coming to constitute the ‘me’ to my ‘I’ at some future point in time. In other words, I’m always constrained by my past but presently able to act freely* within them. I like this framework and it seems to work quite effectively, with my intention being to flesh it out at much greater length when I extend my PhD thesis into a monograph. My problem here is with the failure to conceptualise the interface between the personal and the cultural – it’s a parallel to what I earlier referred to as the lack in Archer’s work of an account of how cultural relations are mediated at the level of reflexive individuals (it’s there in parts, it just hasn’t been worked out thoroughly). Little refers to this as a need for cultural sociology to pay “more attention to the interface between frame and actor”. I don’t think this is simply an oversight but something which would constitutively reorientate the entire approach – I think it would involve an engagement with the ontology of media (e.g. books), biographical questions about how culture reorientates lives and an analysis of the cognitive processes by which ideas are appropriated. At the very least ‘cultural frames’ are inflected through the path-dependent orientation of particular individuals but I think I’d argue for the stronger claim that they are transformed through this appropriation or rejection by individuals – with this individual action contributing to the reproduction or transformation of the frames themselves which are more broadly in circulation within the social world. *I’m talking purely about internal constraints and enablements here for sake of brevity. Obviously external constraints/enablements, as well as the relations between those operating internally and externally, would be considered in practice. This ‘mere reflection’ precludes the relatedness necessary to let an object ‘stand in its truth’. I think this is something akin to the Buddhist notion of Tathatā (“thusness”) which I’ve always understood, perhaps incorrectly, to gesture towards the reality of an object beyond symbolisation. We rarely encounter this quiddity because of our propensity for ‘mere reflection’: we encounter partial aspects, mediated through our intellectualised concepts and past experience, rather than the thusness of the object. But if we do encounter the reality of the object, its ‘reality’ as an object immediately reveals itself as a function of symbolisation. If we really encounter an object in its thusness, it simply stands in its reality in relation to other existents rather than as something independently self-subsistent. Is ‘thinking’ in Heidegger’s sense a matter of cultivating attentiveness to things and our relation to them? Or am I simply misreading Heidegger through what might very well be a longstanding misreading of Buddhism on my part? I’m aware as I’m writing this (in fact I’m thinking about it) that textual analysis of this sort engenders a feeling of intellectual insecurity in me which runs completely contrary to my considered views about the point of analysing texts. I’m deliberately throwing myself into this book without consulting secondary texts and I’m aware that the insecurity would likely vanish if I were not doing this. But this strategy actually seems deeply appropriate to the book now that I’ve got started. Given I’m not, nor have any aspiration to be, a continental philosopher, perhaps it doesn’t matter whether I read the book ‘correctly’. Though does that mean I’m treating it as a resource to be mined* for insights? I hope not. I think there’s a middle ground between the two but I’m less than sure about what it is exactly and how to articulate it. Another motivation for engaging with this text was my interest in Heidegger’s account of technology, which he begins to discuss in this lecture. However I’m confused by the distinction between technology and the essence of technology. I understand his argument that industrialisation destroys craft, in so far as that it preludes “the relatedness to such things as the shapes slumbering within wood” (pg 23). In so far as thinking necessitates an attentiveness to this relatedness then modernity will tend to preclude thought. But I don’t understand what he means when he says that “our age is not a technological age because it is the age of the machine; it is an age of the machine because it is the technological age” (pg 24). Presumably part of this distinction rests on his sense that we must avoid conflating the instances of technology (machines) with technology as such for risk that a preoccupation with the former obscures the nature of the latter. But what is the ‘essence of technology’? What is the ‘core of the matter’ which is not reached by the “economic, social, political, moral, and even religious questions” concerning technological labour? I’m confused but intrigued by the prospect that we might “attain relatedness to what is most thought-provoking” (pg 25). The “listening closely” necessary for this means we must rid ourselves of the habit of “one-track thinking”: “track has to do with rails, and rails with technology” (pg 26). This one-track thinking is “one of those unsuspected and inconspicuous forms, mentioned earlier, in which the essence of technology assumes dominion”. But what is it? Previous post about lecture 1.1 here. *I originally typed ‘minded’ here. As Freudian slips go that was an interesting one. Following on from this enormously thought-provoking paper by Richard Swedberg on the sociology of thinking, I’ve decided to return to Heidegger for the first time since I was a philosophy student. I really struggled with Heidegger and ultimately justified giving up conditional on the promise that I would one day learn German and read the original texts. Suffice to say I’m not enormously confident when it comes to primary texts in continental philosophy in general and particularly not with Heidegger. But in the spirit of strong misreading I’ll give it a go with the aim of developing my own understanding of thinking rather than deciphering the truth of the text. I understand this relatedness as an attentiveness to the object, preserved in motion through our sustained engagement in what we are doing. It is not rumination as a prelude to action, such that we deeply ponder our plan before enacting it. The attentiveness towards the object is constitutive of our engagement, rather than being a phenomenological extra on top of our physical doing. In attending to the object in a sustained way, the practice is transformed. We enter into a ‘current’ and ‘maintain [ourselves] in it’ (pg 17) rather than standing over and above the object in pursuit of its transformation in line with a pre-existing schema. In doing so, we attend to the possibilities inherent in the object – not in the sense of voluntaristically choosing between them but rather responding to them as someone caught in the ‘current’ through our engagement with the object. Much as the cabinetmaker attends to the potential ‘shapes slumbering with wood’, the thinker inclines “toward what addresses itself to thought” (pg 17). In the half hour I’ve spent writing this post thus far, I’ve noticed my attention be dragged away as the mailbox icon on my browser’s toolbar went from ‘1’ to ‘2’ to ‘3’ before I eventually gave in and checked my e-mail. I’ve now removed the button. Phenomenologically I feel pulled from the current, withdrawn from immersion in a task and once more aware of sitting at my desk, with coffee that’s now run out and a distressingly large list of things I have to do today. From past experience I’m aware that in a similar situation, as a to do list involuntarily stays flagged somewhere at the periphery of my consciousness, I’ll rush a piece of writing like this once I reach the half way point so that I can move on to the pressing exigencies of life. In such case I think I’m no longer responding to the potential forms within the ideas which are my object, closing down possibilities rather than opening them up. I’ve written a few times this year about the phenomenology of blogging. I’m sometimes amazed at how quickly I can write if I sit down and write while the thought is live in my mind. There’s not an article or a post in my mind but simply a thought. It’s at the forefront of my consciousness and it feels different to abstract rumination. On these occasions, I find that writing I’m always pleased with spills out of my mind if I let myself attend to the thought that is pressing me for a response. As I described it over the summer: “when an inchoate idea is at the forefront of your mind and the process of rendering and externalising it feels like one of the most natural (and important) things in the world”. This is the experience I want to better understand. I can only do this with a keyboard. I’ve tried many times with pen and paper but my handwriting becomes unreadable and, as with writing in a document for myself, without the awareness of its ensuing visibility I don’t attend sufficiently to the elaboration of the thought(s) as I objectify them in writing. I simply externalise internal thought, with all its contraction and personalisation, which does not feel like it constitutes the creation of something. It just feels like I’m reiterating things which were already in my mind rather than creating something new, no matter how trivial or mundane that novelty may or may not be. There are elements of this first lecture which I’m slightly confused by. The historicisation of our ‘still not thinking’ repels me. Not because of the history but because of the intellectual conceit I take to be inherent in making sweeping historical claims at this level of abstraction. Likewise I’m not sure if Heidegger’s repetition of this is a rhetorical device (given it’s a lecture) or if it is an expression of the gravity with which he feels this world-historical failure pressing down upon his soul. Perhaps it’s both. But I will persist because these lectures are thought-provoking and, as he says, “thought-provoking matter already is intrinsically what must be thought about” (pg 4). This is probably the most important statement of the first lecture from the perspective of my strong misreading: “what is thought-provoking, what gives us to think, is then not anything that we determine, not anything that only we are instituting, only we are proposing” (pg 6). This is the root of the experience of urgency I’ve described while writing, the particular experience of attending to an idea and elaborating it while it is still pressing upon you. This is the primordial reality confronted through the craft of thinking. I’ve been talking about mainly in terms of writing, largely as a consequence of my own proclivity for thinking-through-writing, but I want to avoid getting stuck in these terms. More broadly, I’d like to understand what is ‘thought-provoking’, what is ‘fascinating’ etc. Richard Swedberg begins his paper Thinking and Sociology by recognising that there may be “good reasons” why these two things are rarely discussed together. Though “all of us think” and “we all know the intensely private character of our thoughts”, these thoughts are fleeting and ephemeral when considered next to things that we say and things that we know. These phenomena have been the closest sociology has tended to come towards looking at thinking itself and the reasons for this are both epistemic (they relate to things that are more or less open to others and tend, by their nature, to use terms that are understandable to others) and genealogical (Durkheim was the founding father most interested in thought yet also the most strongly committed to studying it through its objectification in social facts). Given that social facts are a product of collectivities, “the individual plays a very subordinate role in Durkheim’s work, and most of what goes on in his or her mind belongs to the science of psychology, not sociology”. He understood the categories of thought, collective representations, as gifts of society which should be analysed as social facts. So while sociologists have often looked at the products of thinking, the process itself has tended to be ignored or even dismissed in principle as a possible object of study. We are not simply born with a certain capacity to think. But how can one learn to think? Heidegger’s answer is that it is a bit like swimming: you learn it by doing it. You cannot ‘read a treatise on swimming’: you have to open yourself up to the ‘adventure’ and ‘leap into the river’. If you read a book by a philosopher, you can learn thinking by studying the way that the author asks questions. Summarizing and repeating the ideas in a book does not represent thinking. One should also try to locate and work with what the author does not say – what has been left ‘unthought’. And once this exercise is over, and you have ‘found’ the thinking of the author, you have also to ‘lose’ it. Freeing oneself from somebody’s thinking, Heidegger says, is harder than to find it. The carpenter cannot learn his craft in some abstract manner; he must develop his skill by working on wood and by sensing what he can make of this material. The wood contains shapes, Heidegger says, and it is the carpenter’s task to sense these and bring them out in the wood. The idea of hidden forms means that the person should use thinking to understand Being. Kant, Kierkegaard and Heidegger all agree that thinking represents its own special activity or, to phrase it different, that one should focus the analysis directly on thinking. This is an approach that sociology may want to follow. It would also appear that sociology should try to study thinking which is a process, rather than thought which is a product. Heidegger’s argument that thinking should be independent of knowing as well as of action raises further interesting questions for sociologists. My own way for how to think is to spend one hour early in the day sitting still and focusing on some topic that needs to be thought through. I do not write, and I do not try to empty my mind so much as to focus it. It is an exercise in thinking, not in meditation. I usually find that my thinking proceeds step by step, and it comes natural to memorize each step. For a long time I was puzzled by Kierkegaard’s insistence that thinking has an existential dimension. I first began to understand what he meant by this when I started to set aside some time for thinking also at the end of the day. It was impossible to engage in thinking when the day was over, I found, without directly connecting broader issues to personal ones. The link between thinking and subjectivity was in this way established in a very natural fashion. A day that has passed in your life – what does this mean? My “own way for how to think” is to blog. I like the notion of a sociology of thinking in part because it gives me a novel frame of reference within which to ponder my own use of blogging. I like it for many other reasons as well though. What do other people think?